A very good website on the Brain Family has been created by John Partington. His extensive research is impressive. 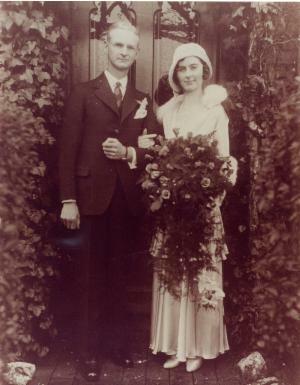 Harry, my grandfather, married for the second time on 21st November 1931 at St Editha's Parish Church, Tamworth. 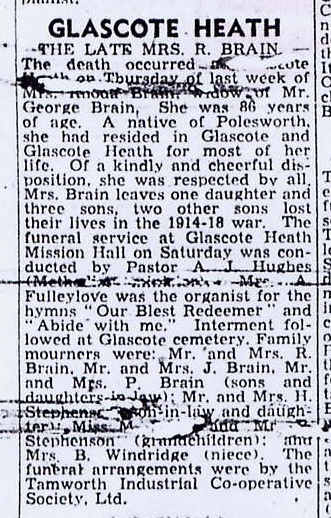 His bride was May Brain, who lived in Glascote Heath with her parents. There are three photos of the wedding in the Photo Album on pages 31-33. Below is another photo of the happy couple. My father was born a few years later. May was the only daughter of George and Rhoda (née Stonehouse) Brain. 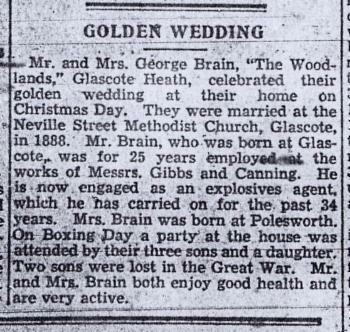 They had married on Christmas Day 1888. Over the next 15 years they had five sons and May, who was the youngest. There were articles in the Herald when they celebrated their Golden and Diamond Wedding Anniversaries. When they both died, they again got articles written about them in the local newspaper. Let's meet George and Rhoda's six children. My parents had told me that he married a lady called Jessie Day. Searching the quarterly GRO records from 1911 - 1951, I could find no Reginald Brain marrying Jessie Day. With "brickwalls" you often have to rethink your research strategies! I decided to search for Jessie marrying in the same period. There was only one Jesse Day marrying in Tamworth in this period. 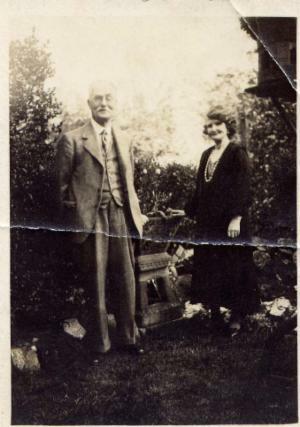 In the first quarter of 1916, Jessie had married Henry J Harris. With the slaughter of the 1st World War, I checked the CWGC database for a possible death. After a few pages, there he was. Henry had died on 27th July 1916. Jessie had only been married a few months. She must have felt that her life had ended too. Returning to the GRO indexes, I searched for a marriage between Reg and Jessie Harris from 1916 onwards. I found them in the first quarter of 1937. My parents didn't know that Uncle Reg was Jessie's second husband. This research took me several hours on the internet on 24th December 2006. I was pleased that my detective work had got the result I was after, yet saddened by what I had discovered. 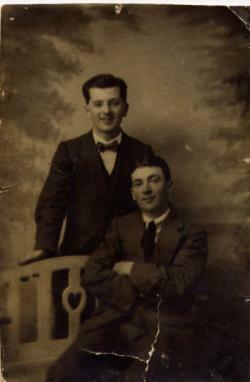 Here is Reg (standing), with a friend. Reg was a very good crown green bowler and was a member of the Tamworth Castle Bowling Club - as were most of the family. Here you will find some newspaper cuttings about Reg and some group postcards. Jessie Brain died in the summer of 1981 aged 87. Jack, spent a lot of his life in the Royal Navy. Reading his Service Record is very interesting. It obviously mentions where he trained, the boats he served on and that his character was always "very good." I can send you a copy if you get in touch. He and his wife (Doris Willdig - married in 1954) were two of my godparents. Auntie Doris died in early 1988, aged 83. 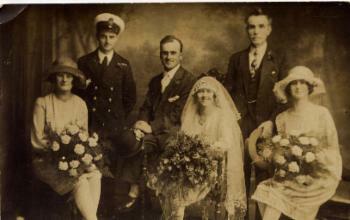 This shows Percy marrying Dora Mercer on 7th July 1928. Dora lived until the age of 99, dying in 1998. We can see Jack (as the best man) in his naval uniform too.